Homemade ice cream just got a whole lot easier! Wait for it, waait for it, waaaait for it, waaaaaait for iiiiit, waaaaaait foooor iiiiiit, EAT ME NOW, too late, dark brown piece of mush! And bananas by default come in bulk! So even with expert timing, you suddenly end up with 5 or more bananas being ripe at exactly the same time… What to do now? I hate wasting food, but I won’t eat all of them in one sitting either. So a good alternative is freezing them! It sounds somewhat odd, but bananas freeze pretty damn well! They will hold for a few months and are really versatile. Throw the frozen banana into a smoothie, banana pie or your oatmeal! Even better, frozen bananas make for delicious homemade ice cream that is done in literally seconds! With their soft texture you can probably already imagine, that when blended smooth, bananas will give you almost the same mouth-feel as regular ice cream. Banana ice cream however is a lot healthier and doesn’t require an ice-cream maker or any other fancy equipment. A simple blender will do the job. In order to use frozen banana, well, you need to make frozen banana… Don’t throw your whole banana into the fridge though. Peel them, slice them up, put the chunks into a zip-lock bag and freeze. With this method you will always have banana at hand and can get out just as much as you need. 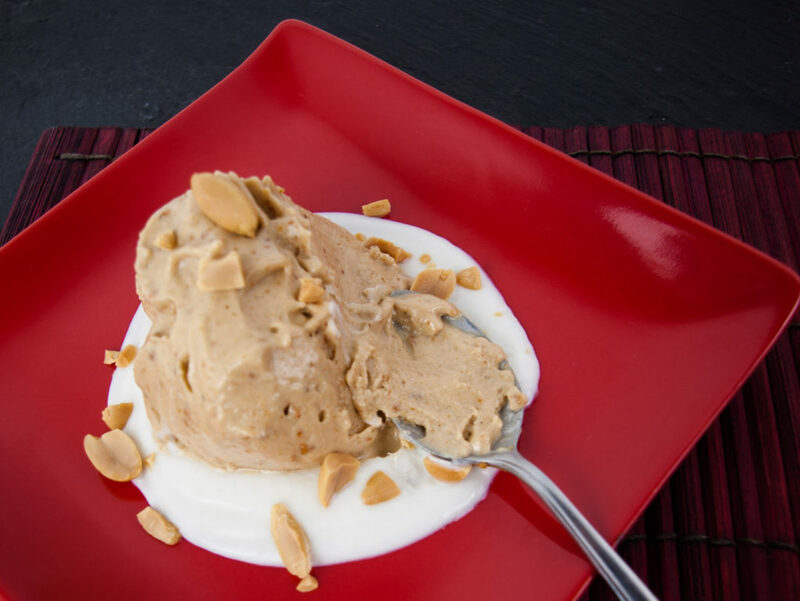 As peanut butter is practically bananas’ BFF you know what to do: make delicious peanut butter banana ice cream! No more wasted bananas – ice cream made in seconds – healthier than store bough. It’s the perfect win-win-win situation! Did you know that most of us peel bananas the wrong way? So, before proceeding: google the right way to peel a banana!! Okay, permission granted to go bananas (and to go nuts)! Blitz banana chunks, peanut butter and yoghurt in a blender until smooth. Yep, sorry, it’s just one step. End of the recipe! Get a spoon and eat your homemade healthy ice cream! Let me know in the comments what you think of this homemade ice cream! Any variations of this you would love to try? What kind of peanut butter works best for you?